This morning I drove up to visit with my grandchildren in Brooklyn, Connecticut, and the visit was a little gift for me, a special way to start a summer day. Noah, Ava, and I hung out together in the playroom while Jaimie worked out on his bike in the garage. I read two books to the kids, with both of them snuggled up against me, eyes riveted on the pages. Ava was a little restless, twisting and turning and examining her feet, but she always, now and then, came back to the pictures in the book. Noah, on the other hand, was entirely attentive to the stories. Whenever I turned to glance at him, I saw his eyes staring directly at the page I was reading. Later, we wrestled and shouted and made forts, and as we did, I couldn’t help but notice how kind and helpful Noah was. He constantly offered to get things for us, to show us how to do something, or to allow us to do something before him. The wind these last two days made my bike rides especially adventurous. Today I battled head winds all the way to Stonington, and then seemed to battle a head wind all the way back. My bike was swaying left and right, even seemingly backwards and forwards, as I peddled along Route 1. Fortunately, the road home was a fairly flat one, so it was just the wind and me with no hills to interfere. 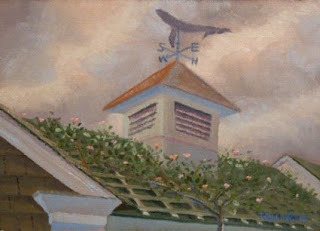 I was happy to sail into Westerly and find shelter from the wind among the buildings in town.